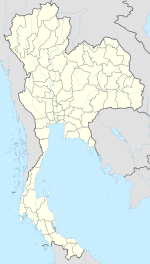 Uthai Thani (Thai: อุทัยธานี, pronounced [ʔù.tʰāj tʰāː.nīː]) is one of the provinces (changwat) of Thailand. Neighboring provinces are (from north clockwise) Nakhon Sawan, Chai Nat, Suphan Buri, Kanchanaburi, and Tak. It is in Thailand's lower northern region, somewhat off the route between Bangkok and Chiang Mai. It is approximately 200 km from Bangkok. The province stretches from the upper plains of the Chao Phraya River valley, to mountains covered with forests in the west. The Sakae Krang River, a tributary of the Chao Phraya River is the main watercourse of Uthai Thani Province. The Huai Kha Khaeng Wildlife Sanctuary, at the western boundary bordering Tak Province, was declared a World Heritage Site in 1991. It covers 2,574 km2, and is home to most of the forest animals of Southeast Asia, including tigers and elephants. Originally Mon and Lawa settled in the area. The first Thai settlement in the area was Muang U Thai during the Sukhothai Kingdom, but it was later abandoned when the river changed course. The Patabeut people, of Karen ethnicity, revived the settlement at its current site during the Ayutthaya Kingdom. It served as a fort protecting the boundary of the kingdom. Uthai Thani is the hometown of the father of King Rama I. Rama I renamed the city from its old name Uthai to Uthai Thani. In 1892 King Chulalongkorn (Rama V) added the area of Uthai Thani to the Monthon Nakhon Sawan, and in 1898 formed the province. The provincial seal depicts the pavilion at Wat Khao Sakae Krang. It houses the statue of Thongdee, the father of King Rama I and a Buddha footprint. The mountain in the background symbolizes the location of the pavilion on top of Khao Sakae Krang. The provincial flower is the yellow cotton tree (Cochlospermum regium). The provincial tree is the neem (Azadirachta indica v. siamensis). The flag of Uthai Thani depicts the provincial seal of Uthai Thani in the middle. The yellow colour at the top of the flag is the colour of the Chakri dynasty, symbolizing gold. The green colour at the bottom is the colour of King Rama I as he was born on a Wednesday, which is associated with green in the Thai calendar. The text below the seal says Uthai Thani Province. The province is divided into eight districts (amphoes). These are further subdivided into 70 sub-districts (tambons) and 642 villages (mubans). ^ "Uthai Thani". Tourism Authority of Thailand (TAT). Retrieved 20 Apr 2015. ^ "Khao Sakae Krang". Tourism Authority of Thailand (TAT). Retrieved 20 Apr 2015. Wikimedia Commons has media related to Uthai Thani.